The Canal District of Worcester, defined as the Green Street / Harding Street / Water Street neighborhood, has been undergoing a development Renaissance over the last decade through the conversion of former mills to loft apartments, and the creation of 5-star dining and night-life venues. One of the most recent urban renewal projects in the Canal District is the Fidelity Bank Worcester Ice Center. This $18 million dollar 100,000 square foot facility was constructed on the former Presmet/GNK Sinter Metals site, and offers two separate skating rinks for local colleges, high schools, public skating, restaurants, gift shop and pro shop. This month’s program will focus on the challenges the project faced from design through construction, offering insights to designers, contractors and facilities personnel working with similar facilities. The site, a brownfield property contaminated by decades of metal coating and processing, required an extensive remediation to be suitable for construction. The building typology needed to balance the needs of a specific catchment (hockey clubs) while being inviting enough to engage the general public visiting the Canal District. Systems for the building required tighter construction tolerances and specialized safety equipment, to support the ice making operations. Now constructed and occupied, the Worcester Ice Center is home to Becker College, Worcester State University, WPI, St. Peter Marian, and Worcester Academy hockey programs as well as youth hockey programs such as the Jr. Railers and the Jr. Crusaders, the Worcester Railers’ Hockey Club, ProSharp headquarters for the U.S.A and all 100% of its retail space has been leased out. 1. Plan permitting and site remediation accordingly when working on a contaminated site. 2. Specify the proper tolerances and third party testing for concrete in ice rink applications. 3. Understand the safety requirements required for ammonia-based refrigeration systems. 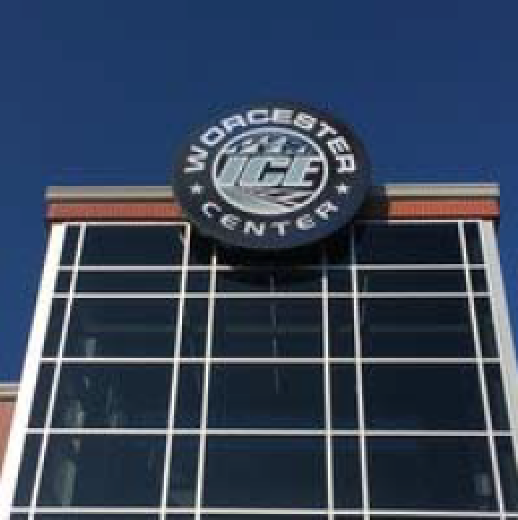 So take a break from the typical lunch-and-learn, and join CSI at the Worcester Ice Center. The program will include a walking tour of the building and its systems, and the group will have access to a private room for cocktails and an optional Italian buffet, catered by the Niche Restaurant Group’s “Nona’s Pizzeria”.